and discover your natural joy of movement! come early, enjoy the ocean-view! or special: 3-Class Pass for $30! and creativity easeful, accessible and enjoyable for everyone. 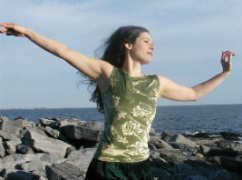 A longtime yoga and meditation educator, energy healer, visual artist and spiritual dancer, Katherine also serves on the faculty of the Expressive Arts Institute at Salve Regina University.